There are several options for ordering these reproductions, starting with providing a general description, including length. (Photos are helpful, but not necessary) Another option is to provide the actual frozen fish (in plastic, not newspaper), which will be used to make an exact replica. Conventional mounts can be used for reproduction or for restoration, including painting and repairing broken fins. 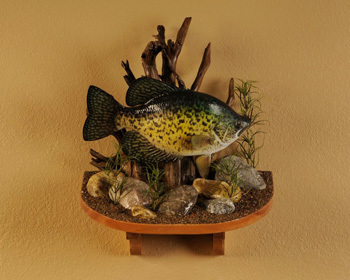 If the fish you have is the size of a mold needed by FiberTech, your replica will be produced for FREE! Years after your adventure is over, the thrill of your trophy catch will live forever through our carbon graphite fiberglass reproduction process. 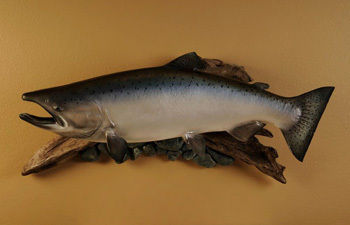 These realistic professional reproductions will help you hold on to the memories and decorate your home or office for many years to come.Even if you never caught that trophy fish, you can still purchase a replica to decorate an office, lodge, sport shop, or home. They also make great gifts! We offer the best service in the industry. With over 35 years experience, if you are ever dissatisfied with your product. Simply return it for an exchange or refund. 150% Satisfaction Guaranteed!! Feel free to call for a price quote. (Wood Display plaques may be extra). Please call for pricing on Saltwater Fish. Please expect 5-6 weeks for delivery time.